Public Service Announcement: For flu season buy balsam, not bamboo. While my husband’s in the kitchen making a chicken roaster to the tunes of Weird Al Yankovic (ladies eat your heart out) I am in the bedroom resting my sinuses on the headboard. Resting, not clearing. For the last two weeks I’ve had a head/chest cold that has taken so long to go away, I’ve googled immunodecificency and green snot to decide if this is normal, which is a strange standard to go by as I also have 20/20 vision and that isn’t normal, judging by the crowd around me. I’ve tried soup, exercise, baths, decongestants, and copious amounts of sleep but the only thing that brings me relief is pouring salt water down my nostrils. I do it four times a day now. It’s an activity you can share online but never in person. Another blessing is my balsam kleenex. When my husband came home with a value pack of three my first reaction was, "For the love of God, no." 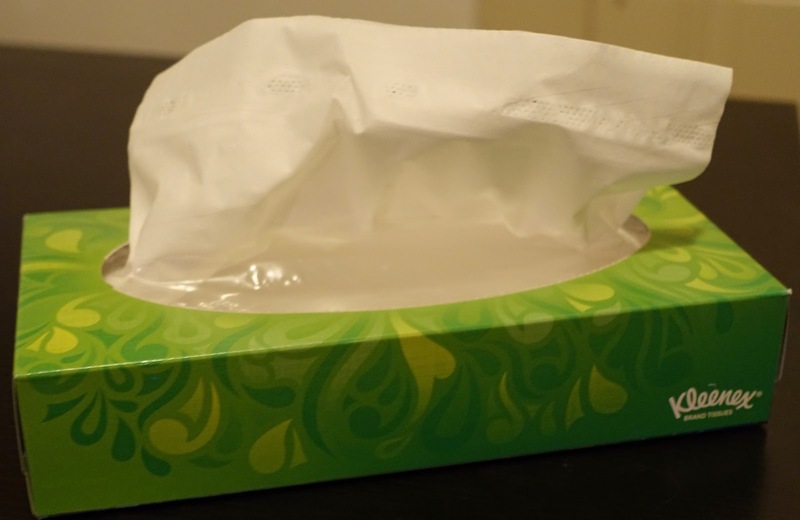 Last summer I had another cold and grated off layers of my nose with bamboo tissue (my nose is big enough to handle it but my pain threshold is not). But balsam and bamboo, both starting with b so it can get confusing, are most definitely not the same. I’m happy to report the end is near. I feel my energy levels returning and soon I’ll be able to break all the promises I made convalescing. But don’t worry dear readers (=3), blogging won’t be one of them.